I'm a firm believer in reading as many books as possible. I think that reading expands our little worlds book by book, as we peer into the real (or fictitious) lives of others and learn from their perspectives. I read these books at various points in my life, as early as in childhood and as recently as this year. But each of these books brought a reminder I needed or shifted my perspective on reading in some way. Most of them were recommended by people I know and love, which makes them even more special. This book is one of the greatest stories I've ever read, and the nostalgic feelings I have toward it mean that I still enjoy it as an adult. I know several children who fell in love with reading because of Holes, and while I loved reading long before I encountered Holes, it still holds a big place in my heart. Its unconventional timeline gives an element of mystery to it, and Louis Sachar doesn't shy away from hard topics that some would consider to be too big for children (racism, poverty, injustice and abuse of authority, to name a few), and that is what makes it so powerful. A few people recommended this to me before I actually read it. My only regret was not taking their suggestion sooner. As a lover of letter-writing and historical fiction, this book was one of the loveliest things I have ever read. From the first page, I fell in love with the characters in it and couldn't stop reading until I reached the end of the book. It's one that has a solid plot and doesn't take a massive amount of emotional energy to read, which is nice sometimes. If you're looking for a book that will make you want to leave your entire life and move to an island in the middle of the English Channel, this is it. This book is one of the most beautiful and heartwrenching pieces I have ever read. It's the memoir of Corrie ten Boom of her experiences during the Second World War as a Dutch Christian whose family secretly housed displaced Jews. She and her family were eventually arrested and sent to concentration camps, where her father and sister died. The Hiding Place is a story of faith amid incredible darkness and forgiveness in the face of unimaginable tragedy. It's not a long book, but it's one that inevitably puts life back in perspective a bit and challenges the reader to think about life and faith and endurance in a different light. The Book Thief wrecked me, and it did not put it back together. I have never cried so hard over a book in my life. When I read the ending of this book, my brother was concerned something devastating had happened in my life. To a certain extent it had, though I don't think he expected it to be due to a work of fiction. The Book Thief takes place in Germany during the Second World War, and tells the story of an orphaned girl whose foster father teaches her to read. In a world that constantly tries to dehumanize the enemy, this book serves as an important reminder that despite the fight against corruption and evil, there are children on all sides who just want to grow up. This is one of the only love stories I will ever recommend to people. This book was recommended to me by a friend who, much like myself, doesn't like to read sappy romance novels. But I sat down and ended up reading it in an afternoon, unable to put it down. It's also a fairly short book, so it's definitely doable for a quick weekend read. It's a story of choosing to live with wild abandon. It's an unconventional love story that makes me unbelievably happy. It's also written by the author of Anne of Green Gables, so if you liked those books as a child (or as a grownup), you'll probably like this too. It's old, but not the dusty kind of old where you feel the need to keep a dictionary on hand as you read it. I first saw this book one summer when I was working at a camp for kids. My co-leader would read this book during the quiet time each day, and she often would share the poems she particularly enjoyed with me. I got my own copy several months later, and every poem is exceptional. It's one of those books that make you want to pack it everywhere. It's got a mix of old classic poems and contemporary poetry, and Garrison Keillor chose a stunning assortment for this book. When I read the title of the first chapter ("Jesus Made Me a Feminist"), I knew I was going to love this book. It's one of those books that wandered into my life at just the right moment. Sarah Bessey's reflections on the experiences of women in Christianity are honest without being bitter, and she keeps her focus on Jesus through it all. As someone who has wrestled with many of the things she addresses, this book is an incredible encouragement to hope in Christ, to find identity in him above all else. She brings the historical context of scriptures into all of her discussion, which makes my little historian heart happy. It could go much deeper into the analysis for Jesus as a feminist, but it was the right book at the right time in my life and for that, I will always be grateful. I only recently read this book, but I can say with confidence that it is one of the best books of the year, and there are few pieces of writing which will make the kind of impact on me that this one has. I had the privilege of being on the launch team for this one and received a copy early to hype it up to the world, and there is really nothing negative I can say about Come Matter Here. Hannah Brencher has a knack for nailing down exactly what I need to hear, and this is no exception. The book talks about planting yourself where your feet are, and challenges the reader to lean into Christ and good community even if life feels like it's falling apart. It's exactly the book I needed in this season, bringing me to laugh and cry (sometimes at the same time) over the beautiful and hard things that life throws at us. What are you reading these days? 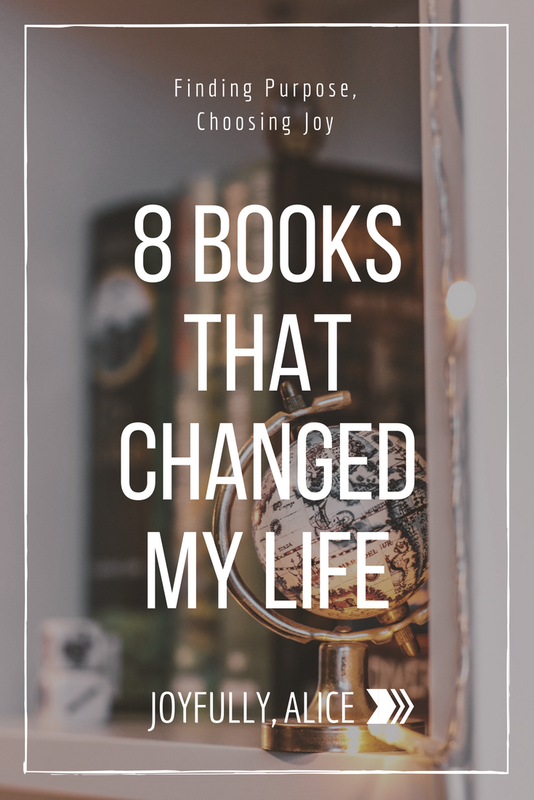 Which books have changed your life? Let me know in the comments.